Home Uncategorized Can you use song titles/song lyrics in your writing? I’ve been asked about using song lyrics often—and of course, as an editor, I’ve had to address it—and while I don’t normally tackle legal issues, I felt that this one was necessary. Music is part of culture, and people relate to music in ways that allow them to relate to others. Because of this, it’s tempting to use song lyrics, but song lyrics are under copyright protection, and if you don’t get the proper permissions, you could get into plenty of legal trouble. This is the big one we’re getting into, and this issue applies to all forms of published work: books, articles, movie excerpts, art, etc. Anything, almost. You need to know that you can get into legitimate legal trouble for using any of this stuff in your book. There’s a general rule about how much you can use before copyright protection goes into effect, but the problem is in knowing how much. There isn’t a spoken rule. Chicago Manual of Style mentions using no more than a few lines in poetry, for example, but states that there is no specified rule. If you have to use lyrics, it’s always smart to get permissions. Just to be safe. Even if you don’t think your book will see the eyes of said songwriter or someone relevant to that particular excerpt, you don’t know. You can’t know. So, why test it? Jane Friedman has a great guide on getting permissions, which you can find here. It’s always a good idea to look at the copyright protection at copyright.gov to see if you need permission in the first place. Permissions can cost money, and they can be frustrating to get. People have a few replacement ideas for song lyrics, and we’ll get to those next. The quickest response most people have to the “don’t use song lyrics” warning is to switch it out for the title, instead. Why not? you might ask. 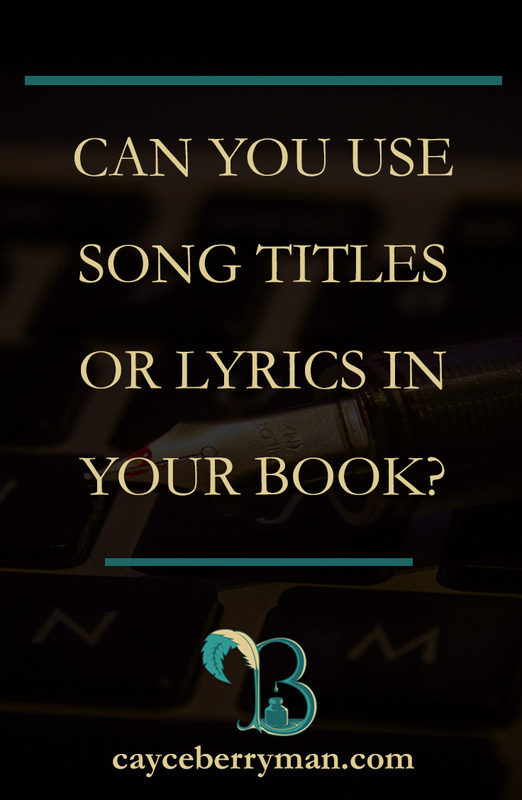 It’s legal to use song titles in your book, but some sources argue that a song title could be trademarked, like this article in Writer’s Digest, and you might hear from someone’s lawyer anyway. I’m not a lawyer, so my response will always be to check. This means look up the protections if you absolutely have to have this song title in your story. But, the general consensus is that using a song title is okay. I don’t recommend against it, but if you don’t need it, it never hurts to take it out. Similarly, book titles, movie titles, etc. can be used. One thing to consider is that no matter how popular a song might be, you’ll find many readers who have no clue. This gives you a hit-or-miss sentence because it will either have the desired effect or it’ll have the opposite effect, and you have to suffer both results no matter the song. Another popular fix to the song lyric problem is to use the band/singer name. These are not protected but are factual, and they are free to use. I do recommend against bashing any band, singer, song, etc. because you could also get yourself in trouble that way. Any form of defamation can get you in trouble. All a person has to do is take action. Why do you think news articles are strict on using sources? Fun fact: everything published before 1923 (I believe) is public domain. I’m one source. For anything legally related, I’ll implore you to look at another source, too. I do my research, but you do yours. It’s like a news article on social media. It might be credible, but nothing is infallible. Well, except God. And, I’m obviously not him. So, do your research. Always. Public domain means you do not have to obtain permissions, so you’re safe! The sticker here is that few know about anything before 1923, but still. You can use it. Creative Commons is like public domain, but it’s under a few guidelines and it’s not limited to things published before 1923. Check out their website to learn more. Be safe. Protect yourself. Don’t do it if you’re not sure. Look up your rights, and look up theirs. Copyright is a nasty business if you’re on the defending end, and you don’t want to be there. Again, I’m not a lawyer, so if you have one you can contact for a particular situation, please do. Law is so hard for us non-law folk to decipher, and someone who works in that industry can help you. I just glossed over the basics, but it’s up to you to do research for your situation. It’s a very frustrating experience to include lyrics during writing. There must be any easy way for this. Few legal issues are easy. It’s a hard thing to deal with, for sure. Thanks for reading it, Kelly! I’m glad it was useful. 🙂 I hope everything goes well when you reach out to the manager. And you’re more than welcome to print it out 😉 but it’ll be updated sometime next year, too, so you’ll have an updated version of this at some point on my new website!